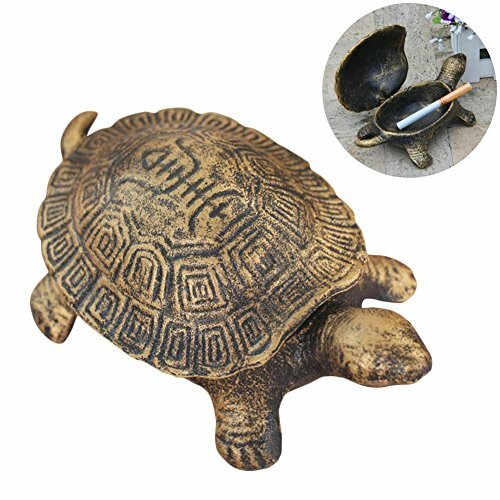 A creative ashtray for smoking people,and also a wonderful decoration of your house with its rustic style.Made of high quality cast iron,with a hidden room under the turtle's shell,reduce secondhand smoke inhalation.A wonderful gift for your familes,friends,guests and so on in christmas/thanksgiving/easter,etc. Made of cast iron,reliable quality, extremely durable. Size: 6.3 x 3.54 x 2.17 inch/16 x 9 x 5.5 cm. Rustic turtle design, washing does not change color or fade. Suitable for decorating your office,living room,study and so on,bring you room a kind of unique feeling. It's a great gift for you to share with your families,friends and so on.